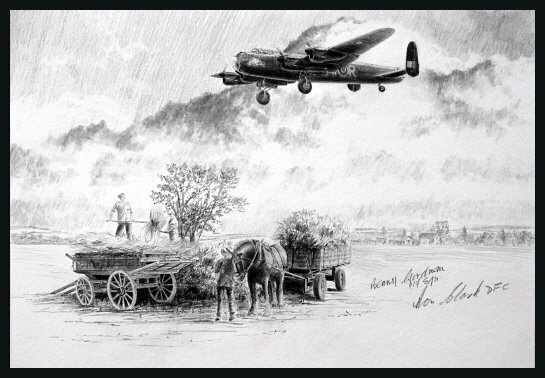 The famous ‘Phantom of the Ruhr’ Lancaster from 100 Squadron returns in the early morning from a mission deep into occupied Europe in the Summer of 1943. Flight Lieutenant Ron Clark DFC - original pilot of the Lancaster 'Phantom of the Ruhr'. Squadron Leader L S 'Benny' Goodman - 617 Sqn Lancaster Pilot who's missions included the famous Tirpitz raid in October 1944, dropping the Grand Slam 22,000 bomb on the Arnsberg Viaduct in March 1945 and the attack on Berchtesgarten, the ‘Eagles Nest’ in May 1945.